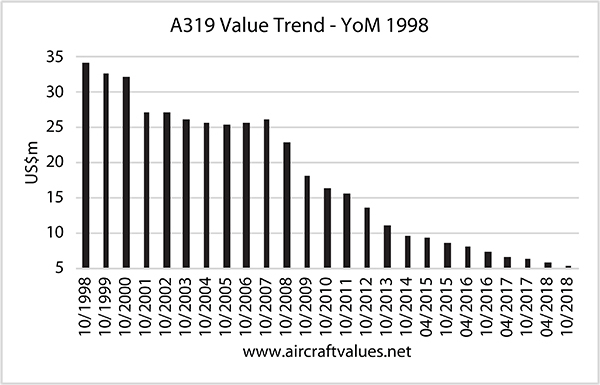 The historical trend for values of the A319 initially showed some relative resilience but since 2009 have continued to slide down even if the rate of fall has slowed for the older examples in recent years. The value of the A319 in 1998 was approximately $35 million and because the market was beginning to replace B737-200s, B737-300s and DC9s, the decline was modest, certainly below the average ten percent annual fall. But even though the events of 2001 shook confidence in all types, the recent service entry of the A319 ensured that the effect was more limited. The fall between 2000 and 2001 was only some 15 percent which was much less than the 30 percent or more suffered by types no longer in production. With the market still seeking to match capacity with demand and in the face of relatively low load factors, the demand for the A319 recovered with values for the 1998 vintage aircraft actually rising through to 2007. With the Great Depression, values experienced a significant fall from which they have not recovered although in 2014 and the 2015 the fall was modest. The age profile of the A319, with most of the deliveries having taken place up to 2010, meant that the used market was experiencing greater supply. The placement of used A319s has not been that difficult perhaps because pricing has been realistic. The values of such old aircraft – now in excess of 20 years – more equate to scrap levels with virtually all the value residing in the engines.